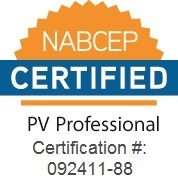 Why is now the best time to install a solar energy system? Currently, the federal government offers a 30% tax credit on all costs associated with installing a renewable energy system. In addition, the state of Iowa recently passed a solar energy only tax credit equal to 18% ($20,000 business and $5,000 residential cap) of the costs associated with installing a solar energy system. Check with your local Utility company and they may be offering Rebates or low interest Loans to install. Businesses installing solar energy also have the added benefit of bonus depreciation. With all the incentives, a solar energy system can pay for itself in less than 5 years. To find out more about Rebates and Tax Credits for your state, visit the DSIRE website and click on your state. Please contact us if you have any information. Sizing a solar array is based on both your usage and your available area to install solar panels. It is not necessary, and not always practical, to match or exceed your entire usage. We can install any amount of solar panels to fit your needs. Farms and larger businesses can install any amount of solar possible given enough space. Large systems can save thousands of dollars every month in electricity. What are lifespans and warranties? We only install panels with a 25 year guaranteed power output. A respectable solar panel should operate over 30+ years. Can I put solar panels on my roof? Solar panels and their mounting hardware are not heavy, but add up in weight as a system builds in size. A modern house or Agricultural Building with a modern roof should have no problems supporting the load of a solar array. We will work with our partner Gexpro to insure that your roof is able to handle the additional loading from the Solar System. The second consideration for installing solar panels on a roof is orientation. Solar panels work best at an angle facing the South. If your roof does not face South, you are not excluded from installing solar panels, you will have to install a few more panels to meet your needs. Visit the Iowa Energy Center Website to get more information on your exact location. Please contact us if you have any information. Does hail and snow hurt the panels? The solar panels that we sell are rated for hail impact using 1" diameter hail moving at 50MPH. Snow is no problem for solar panels. It can build on the surface of the panel, but a properly oriented and tilted panel will allow snow to melt and clear itself in a few days. No, several methods of mounting solar panels exist not only for roof mounting, but for ground mounting. Given the right amount of ground space, large and small solar energy systems can be installed successfully. What type of maintenance is involved with a solar system? In normal, day to day operation, there should be no maintenance required to keep your system operating at its peak. In certain circumstances, the panels may need to be washed off if there has been no rain. What is the next step to get started with solar energy? In normal, day to day operation, there should be no maintenance required to keep your system operating at its peak. In certain circumstances, the panels may need to be washed off if there has been no rain. Give us a call or fill out our contact form. We would be glad to review your site and go over your options, no pressure.